While some gaffs in media reporting for the event had been expected, one report in particular drew heightened attention for the poor quality of his report: the arrival ceremony coverage by GMA News c/o Mark Salazar. His report was a only 2:25 long. But he managed to pack a fair number of errors within that interval. Many things that he got wrong were actually already covered in numerous news reports leading up to that day, and were even re-answered by the Flag-Officer-In-Command (FOIC) of the Philippine Navy himself the night before, on a rival news channel. (A link to this interview is available at the bottom of this post for reference). The following table lists several issues with his report. At 01:04 of his report, he claims that the ship cannot reach the Spratleys Earlier in the same sentence, the reporter stated that the ship had a range of 14,000 miles and had actually sailed to the Philippines from California, USA. Since the western-most occupied island in the Spratly island group is only 736 miles from Manila, and 480 miles from Ulungan Bay in Palawan, how can a ship that can cross the Pacific, with a range that he himself said is in the thousands of miles, not be able to reach such a relatively short distance? At 01:54, the reporter claims that the PN does not yet have plans to acquire additional ships Five months prior, GMA News, the reporter’s home network, actually released one of the first reports that more than one Hamilton class boat would be acquired, c/o a report by Amita O. Legaspi. See: http://www.gmanews.tv/story/217694/nation/aquino-govt-to-release-p11b-to-acquire-more-afp-arms-gear. VADM Pama confirmed that two additional Hamilton class WHECs were already in the pipeline in the above-mentioned interview with a rival network. At 01:58, the reporter claims that the ship was bought with funds from the General Appropriations Act This report is erroneous on two key matters. First, specific acquisition items are not mentioned in the General Appropriations Act. The AFP’s P5B modernization allocation is a single line item that simply states how much was set aside for equipment purchases. See here. The Act does not go into specifics and does not even discuss the AFP Modernization Trust Fund which is where funds are actually pooled. Second, the statement completely ignores the often reported fact that funds for this ship were sourced from the proceeds from Malampaya. It was a DOE funded project.Albeit reported later, Florencio Abad, Secretary of the Department of Budget and Management, clarified that the amount was drawn from a special account maintained by the Department of Energy for Malampaya revenues. See here . It was a classic case of a reporter who did not understand the topic upon which he was tasked to report. In the Internet age, there really ought to be no excuse for going into an assignment cold. But alas . . . that’s exactly what happened here. Had Mr. Salazar, or whoever allowed him to go on assignment unprepared, simply took notes from the following interview, practically all the gaffs above would have been avoided. 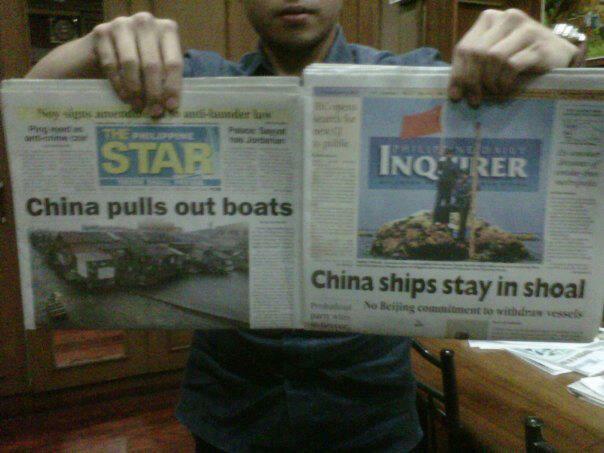 This entry was posted in GMA News, Philippine Navy on September 7, 2011 by adroth.